20 DIY Clock Ideas Telling You Time with A Dash of Prettiness! Home » DIY PROJECTS » 20 DIY Clock Ideas Telling You Time with A Dash of Prettiness! No matter how digital the generation goes, wall clocks are something that never seem to lose their magic. Forming an integral part of an accomplished room decor, a clock must complement the theme of the interior, while being easy-to-comprehend when it comes to checking out the time. And these DIY clock ideas serve the purpose just right! Everytime you check the time, get reminded of one of your precious memories with that one-of-a-kind photo backdrop behind the numbers. The key is to print your favorite picture with the numbers printed on top – any clock template on the internet comes handy. Adhered to a wooden board, the picture gets a distressed effect with a clever application of Mod Podge. Add a rustic appeal to the space with a pallet clock that’s as pretty to look at as it’s easy to put together. Join the pallets together with strips of wood and screws, tracing and painting the numbers, further getting the weathered look by a careful sanding of the digits. Once you put the clock mechanism and hands in place, your DIY clock is all set to hang. A vintage book doubles up as an antique-looking clock table number with just a few tweaks. Taking a circle shape as the reference, the numbers are beautifully stamped onto the front, while for the back of the cover, you can go for small quotes or message, or personalize it according to your whims and choices. The hands are glued and set upright to mark the time. All you are going to need to work up this fabulous farmhouse clock is some pallet wood, wood boards, a nail gun, jigsaw, some string or twine, Minwax golden oak stain, a paintbrush, some antique white milk paint, black paint pen, alongwith clock hands and movement. The combination of white with rustic wood looks oh so splendid. The backdrop for this elegant clock is a khaki painted canvas, going just right with the handwritten “Whatever I’m Late Anyways” message in black. Even the randomly dancing numbers of the bottom right of the clock adds so much more charm to the clock. The author adds the clock kit in the middle following the instructions mentioned on the same. The fact that a beautifully metallic bicycle wheel forms the foundation of this clock is enough to make it one of the most interesting decor elements of the room. And it’s surprisingly easy to work up the clock using a paint stick can lid, some weights, a clock kit specifically designed for large hands, and yardsticks. Even if you are a total novice at crafts, you can pull off these magical embroidery hoop clocks with utmost perfection. Calling for just a few minutes, this one’s a totally no-sew project that’s all about lovely patterned fabrics stuck inside embroidery hoops. Cardboard strips arranged in X at the back of the fabric is used to attach the clock kit. Each of the digits of this extraordinary homemade clock is centred within super adorable plastic frames arranged on a backdrop of a soft pastel blue fabric sheet. Once you paint the frames with your choice of color, add the vinyl numbers onto each, lastly, gluing the frames into place. The numbers are a combination of graphics, romal numerals and digits! 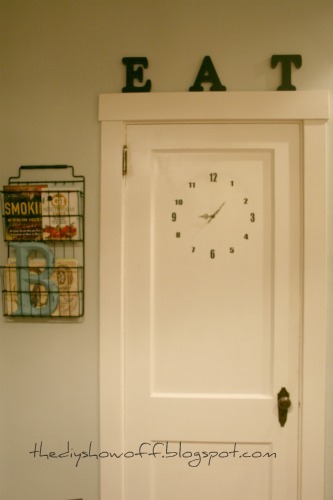 Ditch the regular idea of a wall clock, instead work up a do-it-yourself clock on that cute door panel of the room. You’ll love how easy it is to get the perfect clock design assembling a few simple supplies, including clock hands, large serpentine design, large Serpentine clock hands, mini Quartz movements, extra washers, vinyl numbers, yardstick, pencil drill, and a dinner plate to trace. Undoubtedly, the most edgy element about this clock is its mountain-inspired shape, and the minimalism with which it has been put together. The below inspiration by Sayyes shows you can craft your very own versions of this uber cool mountain clock, using birch plywood, clock movement kit, pencil, ruler, scroll saw, belt sander, paint, paintbrush, wood glue and drill.